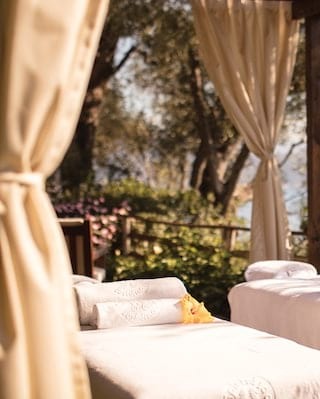 Expert practitioners, treatments rich in essential oils and an ambience of perfect harmony—this Portofino spa is Italian indulgence at its most sophisticated. Soothe mind, body and soul with a botanical massage. Polish up with a manicure. Then unwind in the sauna, nestled in the shade of our verdant Mediterranean gardens. Sink into a secluded spot in our gardens to enjoy a manicure or pedicure with a view. Our therapists will pamper you to perfection while you admire the azure blue horizon. With nails perfectly polished, sit back and unwind with delicious canapes and a bespoke cocktail inspired by your nail colour. This tempting treatment is perfect for birthday parties and brides-to-be. Embark on a sensorial journey through the Mediterranean. Your ritual begins with a calming blue camomile footbath followed by a full-body exfoliation with sea salt and essential oils. Enjoy an almond and ylang-ylang body massage and a facial massage with basil, sage and camomile oil. With skin glowing and regenerated, sit back and relax over almond tea and basil biscuits. Feel truly pampered with treatments using the finest natural spa products in the country. Italian resort spa products with a difference: Mei is famed for its pure essential oils and natural ingredientsm while Oway is a leading light in biodynamic haircare. Escape your daily routine and enjoy total rejuvenation.